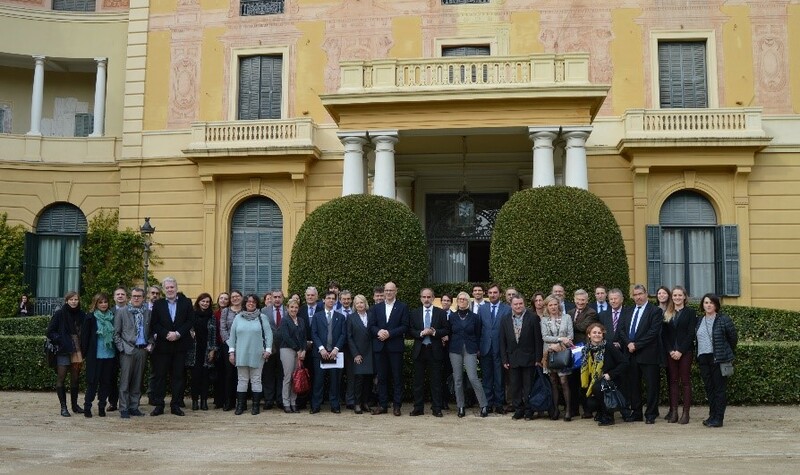 Regions making up the CPMR’s Intermediterranean Commission (IMC) gathered at its Political Bureau on 1 February to discuss key issues including perspectives for Blue Economy in the Mediterranean and Migration challenges. A Final political declaration was also approved by the regions who attended the meeting. As well as political and technical representatives of the IMC Regions, the meeting brought together Mr. Christos Economou, Head of Unit ‘Maritime Policy Mediterranean and Black Sea’ – DG for Maritime Affairs and Fisheries of the European Commission, and Mr. Miguel García-Herraiz, Deputy Secretary General for Water and Environment – Secretariat of the Union for the Mediterranean. 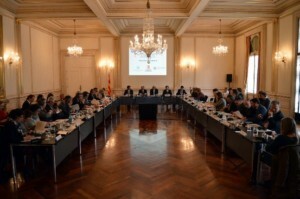 The meeting was held back to back with the Stakeholder conference – Towards an initiative for the sustainable development of the blue economy in the Western Mediterranean. Debates during the Bureau focused mainly on the forthcoming West Med maritime initiative and the perspectives for Blue Economy in the Mediterranean, as well as on migration issues. 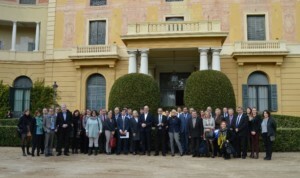 Raul Romeva, Minister for External Affairs from the Government of Catalonia welcomed the participants at the Royal Palace of Pedralbes, stating that “there is the need to advance firmly towards the cooperation between all the rims of the Mediterranean for a sustainable and inclusive development of all the region”. He also affirmed that the forthcoming maritime initiative for the West Mediterranean is an opportunity to demonstrate the potential of the basin, saying: “Maritime professions, sustainable tourism as well as blue energies, the response to phenomena like coastal erosion or to marine pollution, are aspects that must be dealt in a collective way in order to be more efficient”. In the same vein, Apostolos Katsifaras, President of the CPMR IMC and the Western Greece region, stressed that we have to look at this emerging initiative as a pilot that could be extended to the rest of the basin, and especially to the eastern Mediterranean. He also underlined the need for synergies with existing macro-regions as the EUSAIR. Other members stressed the multilevel governance aspects, the need for mainstreaming of funds, the role of cooperation programs and the wish that the European Commission and the Member States could agree – during the Maltese presidency of the EU – on an Action plan for the concrete implementation of projects on the ground. Following this debate, on 2 February the IMC regions conveyed their ideas for the process and future actions that could be undertaken. This first reactions are summarised in the first section of the Political declaration of the IMC PB on how to boost blue economy while protecting the environment through emerging strategies & initiatives. Across the debates, many other political representatives of regions such as Rabat Salé Kenitra, Campania, PACA, Lazio, Crete, Peloponnese or Gozo stressed their support to the West Med as well as the work of the EC-DG MARE and UfMS and explained the challenges, potential and experiences related to Blue Economy (BE) in their own territories. Guido Fabiani stressed that “the sea is the main component of a process of sustainable reindustrialization of the Mediterranean economy”. It is worth noting that the IMC will set up a specific Task force to foster the follow-up and implementation of the UfM Agenda on BE in the Mediterranean regions. Concerning migration, President of Murcia, Pedro Antonio Sánchez López, together with Oriol Amorós, Secretary for Equality, Migration and Citizenship from Catalunya and Monica Barni, Vice-President of the Toscana Region, presented their vision on the current challenges. They also shared several experiences and debated with IMC PB members like Occitania, Region of Valencia, Andalusia and the Ionian Islands on the possible way forward concerning migrants’ reception and integration, cooperation with countries of origin of migrants (e.g. through decentralized cooperation and co-development) and main needs from the ground. Murcia’s president, Pedro Antonio Sánchez López, underlined that regions need “brave policies of cooperation, integration and migrant reception to generate new opportunities in order to make the Mediterranean a sea of unity and opportunities and not a cemetery of people searching for a better world”. From this perspective “the EU should fund directly the regions that are receiving and welcoming migrants”. The main recommendations and concrete actions to be promoted on this theme are included in the second section of the Political declaration on the involvement of Regions in the decision making processes regarding migration. The third part includes IMC messages related to other key themes for Mediterranean regions such as the Neighborhood Policy, Territorial Integrated Development, Socio Economic-Cohesion, Energy, Water and Transports. Furthermore, at the end of the political discussion, Regional Minister Bianchi, of Emilia Romagna, gave the audience a keynote speech on the contribution of “Big data” to the sustainable growth of the Mediterranean, as a new frontier for innovation. The IMC regions will gather for further project and Working Group meetings, including the next General Assembly that will be hosted by Campania region on the 6-7 July 2017 and the next Political Bureau, which will be hosted by Murcia in the last trimester of 2017. View the agenda and the public working documents for the Intermediterranean Commission (IMC) Political Bureau. You can also view the summary/conclusions of the six discussion panels at the Stakeholder conference – ‘Towards an initiative for the sustainable development of the blue economy in the Western Mediterranean’.